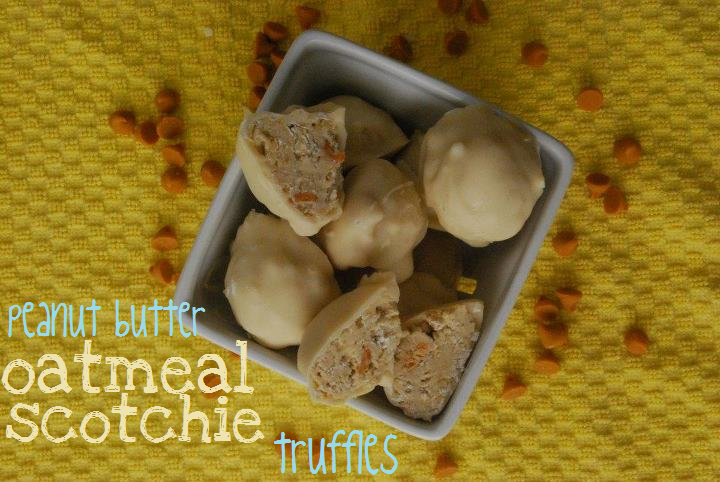 Peanut Butter Oatmeal Scotchie Truffles: The Great Blogger Switch-Up!! I can literally get inspiration from anywhere. I can be in a public restroom, listening to the sounds of people pretending no one else is around as they try to get over their pee anxieties, and suddenly get an idea for a cupcake. And no, it isn’t a urine flavored cupcake, thank you very much, but just a random, fleeting idea I’ll get somewhere unexpected. When I decided to start a food blog, it was long before The Domestic Rebel was even born. I had a teensy, stupid little blog with a complicated name (one I forgot on a daily basis–was it ‘Hayley, Just the Girl Next Door’ or ‘Just Hayley, the Girl Next Door’? Note: when you can’t remember your blog name, it’s probably a big, fat, red flag you won’t succeed. Just sayin’) and really, no inspiration. Not surprisingly, after less than a month with about only one post every couple weeks, I grew tired of it and shut her down–rightfully so; I think anyone reading it (which was less than 30 people, all me I think) probably cringed, renounced the internet for its awful, moronic content and became a nun, hoping to live their life in solitude, never using the world wide web ever again after reading such a crappy blog. And then I found some inspiration while blog-surfing one day. I came across two (now very famous) blogs and fell in love with them. The layouts, the story-telling, the recipes–everything about these blogs were intoxicating, enlightening and totally inspirational to me: the girl with no direction but a fire burning nonetheless. Shortly thereafter, I got my bearings, started The Domestic Rebel, and modeled myself after these bloggers as best I could while still staying true to myself. If you ever check out my older posts, you’ll notice I have no voice whatsoever–and that’s probably why I had all of 5 visits a week and nothing more. The early stuff is cringe-worthy! But after blogging for awhile, I realized there were SO many other amazing blogs out there I hadn’t even noticed yet. Blogs with different perspectives, beautiful pictures, professional layouts and seamless stories that I became so mesmerized by. And to this day, I’m continually finding new blogs I’m falling in love with on a daily basis–and I’m continuing to feel more and more ideas sparking from the rich inspiration I derive from each individual blog I find and read. Not surprisingly, I’m attracted more to the blogs that are like mine & I don’t think that’s a bad thing. Honestly, finding blogs that mimic your voice, aesthetic and style of cooking are more fun, I think. The inspiration becomes stronger, the ideas go from sparks to straight-up wildfires in your brain, and it’s awesome to connect with the people who are more like you and believe in cake mix, using an exorbitant amount of butter, and believing that Reese’s Peanut Butter Cups can be eaten for dinner several times a week. Obviously my love affair for Sally at Sally’s Baking Addiction was justified then. Logical and predictable, even. I’ve only recently discovered Sally, but I am beyond excited I have. First of all, Sally is a world-class sweetheart. Her comments never cease to make me smile, and she is so warm and friendly–something that’s hard to feel when you’re only sitting behind a glowy computer monitor and not face-to-face with someone. Second, she’s like my long lost twin. Our baking aesthetics are very similar, and she has a way of talking about food and sharing little life snippets that’s both interesting to read and absolutely brimming with her passion and love for baking and food… which I hope you all see in my writing & recipes as well. Plus, she makes stuff like THIS and THIS and ohmahgawd, THIS. You could say it was love at first click… and I’m so glad she didn’t brush off my weird, psycho-esque comments because if she had rejected me over the interwebs, I would have been so very sad. So now we’re basically blondie-loving BFFs and I’m loving it. And when the ever-mysterious but superfantasticallyawesome blogger babe behind the blog Back For Seconds asked us all to join in on a fun, “inspired-by” post of us girls: (Ashley from Kitchen Meets Girl; Dorothy from Crazy For Crust; Sally from Sally’s Baking Addiction; Back For Seconds and myself), I was excited to participate. 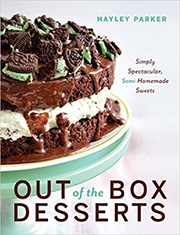 Recreate or create a dish inspired by one of my uber-favorite bloggers? Sign me up like yesterday! We paired up randomly by drawing names out of a hat and I was thrilled to get Sally! And I knew exactly what I wanted to make almost immediately. For one, Sally loves her cookies. She has a TON of awesome cookie recipes on her site, always so puffy and chewy and deliciously perfect. Second, she loves her oatmeal-y treats and prefers butterscotch over chocolate. And she made THESE cookies which totally rock by the way… so I thought, why not combine her love for cookies, oatmeal, butterscotch and peanut butter? It was a daunting task full of taste-testing and butter splattering, but I was willing to take it on. 1. In a large bowl, beat the butter and sugars together until smooth and creamy, about a minute. Beat in the milk and vanilla. Lastly, gradually beat in the flour & salt, about a cup at a time, until fully incorporated. 2. 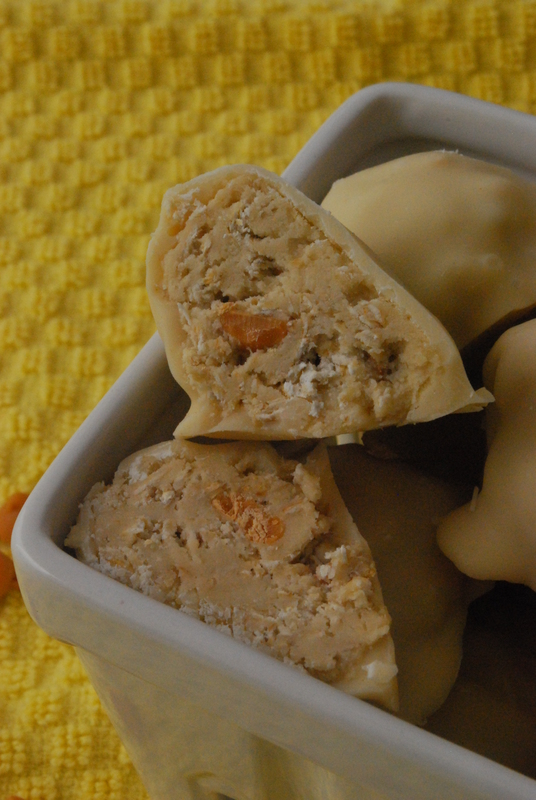 Stir the quick oats & butterscotch chips into the dough with a spoon. 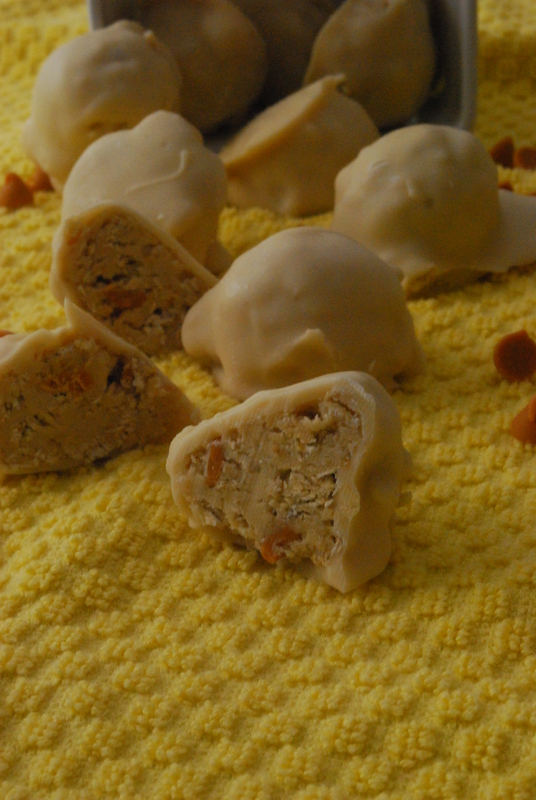 Using a small cookie dough scoop, scoop small balls of dough and place them onto a foil-lined baking sheet. Repeat until all the dough has been scooped into small balls. Freeze the dough balls for at least 6 hours or overnight, if possible. You want them good & frozen! 3. In a large bowl, prepare the almond bark according to package directions, stirring until smooth & melted. Stir in the peanut butter to combine. 4. 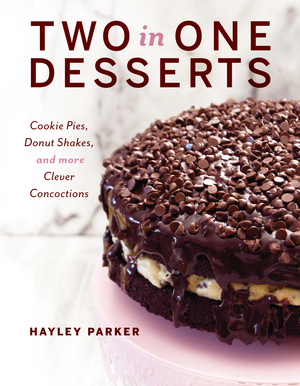 Using a fork, dunk each frozen truffle into the pb mixture, coating completely, and allowing the excess pb mixture to drip off. Place the truffle back onto the baking sheet and repeat with remaining truffles. Pop the truffles back into the freezer to set the coating, about 20 minutes, before eating. 5. Store leftover truffles in an airtight bag in the fridge or freezer (fridge 1-2 days; freezer 4-5 days). Uuhhhhh, holy yum. These taste just like oatmeal scotchie dough and the peanut butter coating adds a nice sweet & salty hint to the soft, buttery cookie dough inside. I die. To see Dorothy’s muse, click HERE. To see Ashley’s muse, click HERE. To see the ringleader’s muse, click HERE. To see Sally’s muse, click HERE. Be sure to check out the other awesome, inspirational stuff everyone else made!! Have a sweet day!! I had to laugh reading this though – we are total twins…. 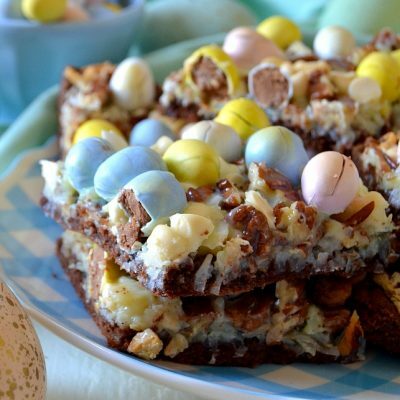 After seeing these pictures and reading your recipe I totally said (out loud) “holy yum!”. No lie. The next thing you wrote was… Holy yum. THEN after describing thiss glorious truffle you wrote, “I die”. Totally did the same thing in my post today!! What is up with us and our sameness lately? Haha! Thanks again for jooining in the fun. You rocked it! Sally will be proud, ha! Hahahahha I don’t know!! I think I picked up too much Rachel Zoe language when I watched her show on Bravo: “that’s bananas”, “I die”.. lol, fashion meets food I guess!! I second what Stephanie said; you are totally inspirational! I started out mirroring those other blogs too…and now I find myself being inspired by you on a daily basis! Now let’s all go sing cumbaya and go eat truffles. I never knew you could add pb to white melts. Freakin’ awesome. Hayley, you’re like the coolest chick I know. I am so, so glad I found you in this huge internet world! And these truffles?? Beyond awesome. Hahaha yeah, that one was pretty easy to guess! But Ashley did a rockin’ job. Thanks, Kelli! I have never made a truffle like this one before…but I love it! Yay, I’m so glad! Thank you!